Forests provide numerous ecosystem services, such as timber yields, biodiversity protection and climate change mitigation. The type of management has an eﬀect on the provision of these services. Often the demands for these services can lead to conﬂict – wood harvest can negatively impact biodiversity and climate change mitigation capacity. Although forest management diﬀerences are important, spatially explicit data is lacking, in particular on a global scale. We present here a ﬁrst systematic approach which integrates existing data to map forest management globally through downscaling national and subnational forest data. In our forest management classiﬁcation, we distinguished between two levels of forest management, with three categories each. Level 1 comprised primary, naturally regrown and planted forests. Level 2 distinguished between diﬀerent forest uses. We gathered documented locations, where these forest categories were observed, from the literature and a database on ecological diversity. We then performed multinomial logit regression and estimated the eﬀect of 21 socio-economic and bio-physical predictor variables on the occurrence of a forest category. Model results on signiﬁcance and eﬀect direction of predictor variables were in line with ﬁndings of previous studies. Soil and environmental properties, forest conditions and accessibility are important determinants of the occurrence of forest management types. Based on the model results, likelihood maps were calculated and used to spatially allocate national extents of level 1 and level 2 forest categories. When compared to previous studies, our maps showed higher agreement than random samples. Deviations between observed and predicted plantation locations were mostly below 10 km. Our map provides an estimation of global forest management patterns, enhancing previous methodologies and making the best use of data available. 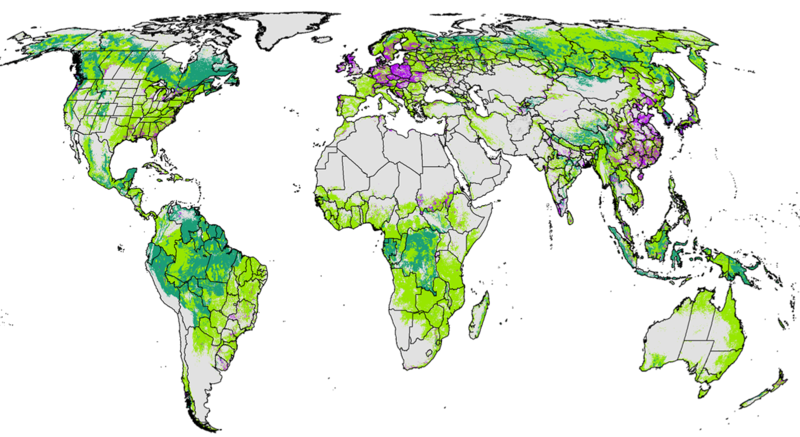 Next to having multiple applications, for example within global conservation planning or climate change mitigation analyses, it visualizes the currently available data on forest management on a global level.